Dr. Harish Rai is originally from India and moved to Illinois in 1986. After graduating from Bolingbrook High School, he continued his passion for medicine and completed his pre-med undergraduate studies at Illinois Benedictine College. He then pursued his passion for holistic care at National College of Chiropractic in Chicago, IL. He earned his Doctor of Chiropractic degree and his Acupuncture in 1999 from National College of Chiropractic. As a young child, Harish Rai always wanted to become doctor. He was introduced to Chiropractic by Dr. Korwitts. After watching Dr. Korwitts treat many people naturally, Harish decided to become “Doctor of Chiropractor”. As he was completing his studies he was introduced to “Acupuncture and Nutrition” for his allergies and sinus infection. Thru Chiropractic, Acupuncture and Nutrition Dr. Rai has not had a sinus infection since 1994. Dr. Rai has used Chiropractic, Acupuncture and Nutrition to help keep him healthy and pain free. 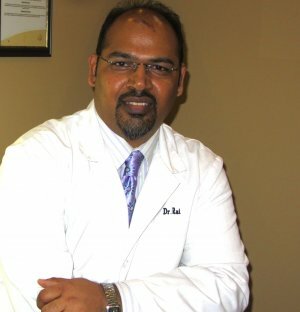 Dr. Rai's favorite part of being a holistic doctor is the opportunity to help as many people as he can live a pain free, stress free and healthy life for a long time. He is very passionate about chiropractic and helping people achieve optimum health naturally. He likes working with all ages group in helping them achieve their goal of getting out of pain and staying well for a long time through holistic care. He enjoys discussing chiropractic, acupuncture, nutrition and exercise with all of his patients. He believes that normal body function can be achieved by restoring normal nervous system function, along with balancing the body energy (CHI), good nutrition and exercise. Chiropractic, Acupuncture, Nutrition and Exercise, can enable a person to be healthy at 100 years old. Dr. Rai currently resides in Canton with his fiancée Kristine and their dog "Raja". Dr. Rai enjoys basketball, tennis, golf and running. Dr. Rai welcomes all patients to experience Chiropractic, Acupuncture, Nutrition and Exercise to live a healthy prosperous long life. Contact us to schedule an appointment with Dr. Rai.